Many of us are in a rush to run further and faster – but to prevent injury, there is a checklist that we should be going though, before thinking about increasing our distance, or even running at all! Below is Part 1, of 6 steps towards injury-free running. I’ve focused on one or two key areas within each, with tests you can do and a yoga based solution that will work on improvement. Ideally we should be able do all of these before we start a training plan, but as long as you are working on improving them all (see suggested yoga), and only running short distances, then you can build your run-fitness concurrently. 1. Mobility (hips) – test: can you squat? 2. Strength (core and pelvis) – test: can you hold a static lunge? Can you do a walking lunge? 3. 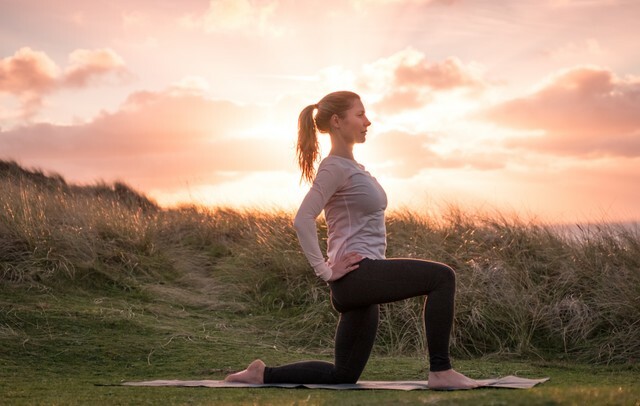 Flexibility (hamstrings and hip flexors) – test for hip flexors: can you take a low lunge with a straight pelvis and back thigh? Yoga solution: spend 3 minutes, in this position with the tail bone lengthening, 3-4 times a week/ post-run. Test for hamstrings: can you like flat on your back and take one leg up straight to at least 70 degrees. Yoga solution: do this, with a strap to hold your foot, for 3 minutes each side, 3-4 times per week/ post-run. Next time I’ll cover the other 3: ABC – agility, balance and coordination. >> I want to hear your feedback, so please post a comment below!